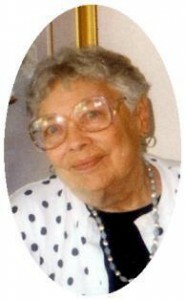 Patricia Paisley, 85, died Monday, September 22, 2008 at her Heritage Nursing Home residence. She was born December 26, 1922 in Chicago, Illinois to Herbert and Helen Peters Riker. She married John “Jack” Paisley on September 24, 1949 in Youngstown, Ohio. They moved from Ohio to Milwaukee in 1968. Patricia worked as a copywriter and wrote ads for a weekly newspaper in Milwaukee and the Menomonee Falls News. She submitted manuscripts to various publishing outlets and received first place in a one act play writing contest and her play was performed in Wauwatosa. She also loved to read, garden, enjoying flowers and plants and loved animals. Her husband Jack preceded her in death on September 25, 1982 and in 1994 she moved to Ozaukee County. She is survived by her children Scott (Jackie) Paisley of Greendale, Susan (Ray) Last of the Town of Port Washington and Neal (Nancy) Paisley of Waukesha. Further survived by her grandchildren John, Jenny and Sarah Paisley, Sam, Caity and Taylor Last and Erin (Kevin) Stueber great grandchildren Eli and Ruza Stueber, other relatives and friends. Preceded by a sister, Betty Riker. Fr. Julian Hill will officiate funeral services 12 Noon Saturday, September 27, 2008 at the funeral home. Family will receive friends from 10 am – 12 Noon Saturday. Memorials to St. Simon Episcopal Church or Ozaukee Humane Society appreciated.